Noticing New York: Occupy Wall Street and the Banks- Messages From Bonnie & Clyde, “They’ve Got Too Much Money”: Ownership of the Public Forum by the Wealthy? Occupy Wall Street and the Banks- Messages From Bonnie & Clyde, “They’ve Got Too Much Money”: Ownership of the Public Forum by the Wealthy? WHAT was he thinking? . . . Hold one minute. . . . For those of you wanting to keep a few steps ahead connecting the dots as they read this, we are heading somewhere important: The skewing of wealth in this country, complained about in the placards hoisted by the Occupy Wall Street crowd is also very much a threat to the ability of the rest of us to meaningfully exercise our rights to free speech. Now, we'll start here . . .
WHAT was he thinking? The very same morning that the New York police were going to be brought in to remove the Occupy Wall Street protesters from Zucotti Park we open the New York Times and there is an article about Mayor Bloomberg’s (and his live-in girlfriend. Diana Taylor’s) dogs, “Bonnie and Clyde.” (See: The Mayor Stands Firm Against the Lobbying of Puppy-Dog Eyes, by Matt Flegenheimer, October 13, 2011.) 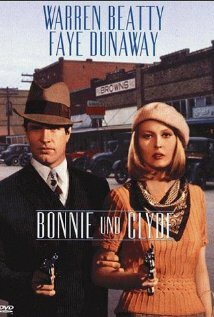 Bonnie and Clyde?- We’ll get to that in a moment. Why do I say what was “he” thinking? When I say “he” I mean the mayor and my question as to what Bloomberg was thinking is because at first blush, the story about the Mayor and his girlfriend’s canine Bonnie and Clyde has the hallmarks of a placed, likely intentionally-timed story. If nothing else, the mayor ought to have known the story was imminent in that we know his spokesman Stu Loeser was contacted. Mr. Loeser contributed an innocuous quote for the story via e-mail. When I spoke to Matt Flegenheimer, the Times reporter who wrote the story, he was unwilling to provide quotes for the record in response to my questions about how and when the story got generated or how cooperative the mayor’s staff had been in its production. That will have to remain a matter of speculation and detective work. An earlier Times story in the dog days of August, 2008 mentioned the pups. Some of the article is discernibly from other sources like the 2010 Bloomberg quote about how late Ms. Taylor walks the dogs and conceivably the new Times article was prompted by a mention of the dogs’ purchase in a September 30th interview Diana Taylor gave to a reporter that appeared in the Observer. 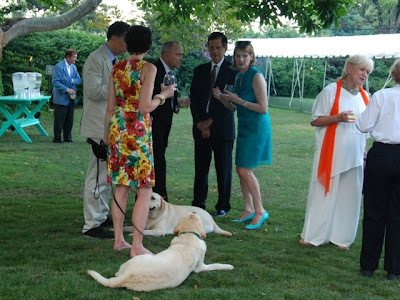 It is impossible to say how much of the inside-the-mayor's-residence tell-all was provided by Robert Haussmann, the dogs’ former trainer who is quoted spilling the beans on some of the dogs’ naughtier escapades and on whose web site a Taylor/Bloomberg testimonial appears together with a picture of Bonnie and Clyde (also at beginning of this post). Was Haussman ratting out the woof-woofs without a go-ahead from his illustrious clients? From another picture on line (see below) it is possible to observe that the leashed Labradors traveled to attend the Gracie Mansion wedding of a Bloomberg aide over which the mayor specially officiated in July in recognition of the day marriage equality become law in New York just as Mr. Flegenheimer mentioned in his story, but without knowing what you were looking for that might be hard to ferret out. As to how long the story was in the works, the reporting specifies that observation of some playfulness of the dogs occurred on “a recent weekday morning.” The caption for a picture accompanying the story specifies that it was taken “this month” which would translate to October or within the previous two weeks, given that the story having appeared on the 13th. The picture of Ms. Taylor, full frontal with both dogs, taken by “Michael Appleton for The New York Times,” though it is not as flattering as the many Nikola Tamindzic photos taken of Taylor for the interview she recently granted the Observer, does not look like a paparazzi ambush (see below). Getting the Dog Ball Rolling? Whether Bloomberg did or not is perhaps beside the point. What is important is that all it takes is the unveiling of just a few domestic details concerning the illustrious Bloomberg household and, Voilà! You have a full-blown New York Times story that is respectfully favorable to the mayor. Meanwhile, the Occupy Wall Street people are spending nights sleeping in the cold fighting to get the press to pay attention for some really important issues Bloomberg and friends would prefer that you not be hearing about- More on this shortly. Poor Recollection of a Rich Reference? Key to the film's vision of misguided criminals verging on the status of near heroes embraced by the public is the idea, similar to themes afoot in the Occupy Wall Street demonstrations, of Depression-era banks as villains, the idea that banks were holding too much of the wealth. During the Depression the severe slowing of the economy together with a period of deflation exacerbated by a contraction of the money supply spurred in part by gold-standard promoting capitalists shifted a lot of wealth and property ownership to the banks: It became more expensive to pay off your debt or mortgage than it was when you had taken that debt on, but the travails of the time were due mostly to old-style conventional banking. Nothing compared to what the Occupy Wall Street people are have to complain about. Did Michael Bloomberg and Diana Taylor name their dogs Bonnie and Clyde because they think like the Occupy Wall Street crowd or is this a scoffing reference to how they obviously don’t? Conversely, would it be a stretch to think they were attracted to thinking of themselves as modern day robbers with a freedom to pillage financially? It ought to be remembered that when they named their dogs Bloomberg was not only the mayor of New York but also, far and away, it’s wealthiest citizen with a slew of conflicts of interest concerning his role as mayor and the fashion in which his wealth was rapidly escalating. 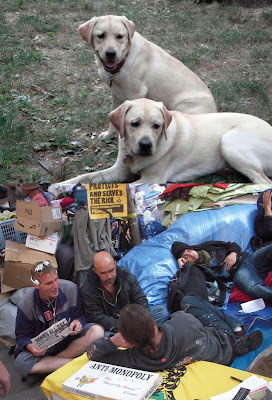 But WHAT was Bloomberg thinking when he thought that the Bonnie and Clyde mayor-has-dogs story was going to run the same Friday morning his police troops were going to move in to evict the Occupy Wall Street crowd? The protesters’ nonviolence notwithstanding it could have been a bloody scene. 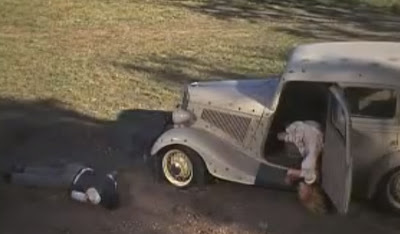 Arthur Penn’s “Bonnie and Clyde” film ends with an iconic bloodbath. Would people have been making comparisons that morning? Where would the public’s sympathies have been? Agreeing with the protesters views are Democrats 81 – 11 percent and independent voters 58 – 30 percent, while Republicans disagree 58 – 35 percent, the independent Quinnipiac (KWIN-uh-pe-ack) University poll finds. Even Republicans, however, agree 73 – 23 percent with the protesters right to be there. New York City voters say 72 – 24 percent, including 52 – 41 percent among Republicans, that if the protesters obey the law, they can stay as long as they wish. 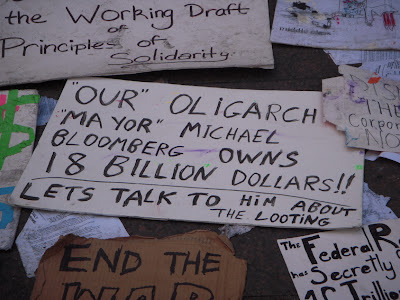 With all this support from New York voters how is it that Bloomberg, an `elected’ official, wants to dispossess the protesters? Bloomberg probably doesn’t think that permitting the demonstrations aligns with his national political ambitions, which at this point could likely involve a hoped-for Republican vice-presidential (or presidential?) nomination. Or, if he plans to put himself forward as an independent party candidate, an example of a 'laudably' nonpartisan businessman (say backed by the “No-Labels party” the emergence of which was mysteriously funded) it will not help him if an anti-Wall Street movement keeps gaining traction. But he wasn’t really talking about voters, of course. He was talking about the one thing Wall Street still has plenty of thanks to those bailouts, despite its total loss of credibility: money. Not all city parks close at 1:00 AM or earlier. Although there are some contrary indications on the web, if you call the Parks Department as I did you will discover that Central Park doesn’t close at night although certain sections like the zoo and playgrounds do. If Central Park did close at 1:00 AM then Mr. Bloomberg’s quote in Mr. Flegenheimer’s article that Ms. Taylor walks Bonnie and Clyde in Central Park at 1:00 AM would mean she was breaking the rules. Maybe the park by the mayor’s residence is open 24 hours a day, but nighttime closings of Union Square and Washington Square have been a factor in preventing Occupy Wall Street from setting up new occupancy outposts. On the one hand there is a delicious and exquisite complexity to the tangled laws respecting private ownership of Zuccotti Park (particularly to an attorney versed in government and NY real estate such as myself) that ironically has made it legally more difficult for the Bloomberg administration to remove the protesters from this quasi-public space than from the city’s actual public parks such as Union and Washington Squares. But on the other hand the obscuring veil attributable to the complexity that stems from the increasing use of private-public partnership arrangements to `privately' provide public space and public benefit is dangerous, perhaps even grotesquely so. Just try to explain to the average citizen the technicalities of the ways in which these arrangements modify their rights to free speech and their eyes will be sure to glaze over. That could be exactly the way the lawyered-up Bloomberg elite may want things. And already Bloomberg’s real estate pals at the Real Estate Board of New York are looking to make retroactive changes to the laws so that the protesters may be evicted. There is a serious problem when what were typically public spaces are replaced with privately owned spaces because there is no law against private citizens depriving other private citizens of their right to free speech. By contrast, under the Bill of Rights the government is prohibited from depriving the public of free speech. That is why problems arise and the high courts have had to visit constitutional questions of free speech when public town centers around the country are replaced by privately owned shopping malls. There is, of course, an argument that the so-called “privately owned public spaces” are really public or quasi-public spaces when government actions confer significant benefits (including at public expense or its equivalent) like zoning or variance negotiations to create them. Therefore constitutional free speech protections should perhaps apply. But with privatization public rights get more complicated. It is perhaps no small irony that the private space (bordered by Liberty Street), now the subject of these vexing free speech riddles, although always privately owned, was once named “Liberty Plaza Park.” Upon completion of a post-9/11 renovation it was, renamed “Zucotti Park” in 2006 in honor of John Zucotti, a public servant as Deputy Mayor in Mayor Beame’s administration but at the time of the renaming one of the city’s most powerful zoning lawyers with the law firm of Weil, Gotshal and Manges LLP. 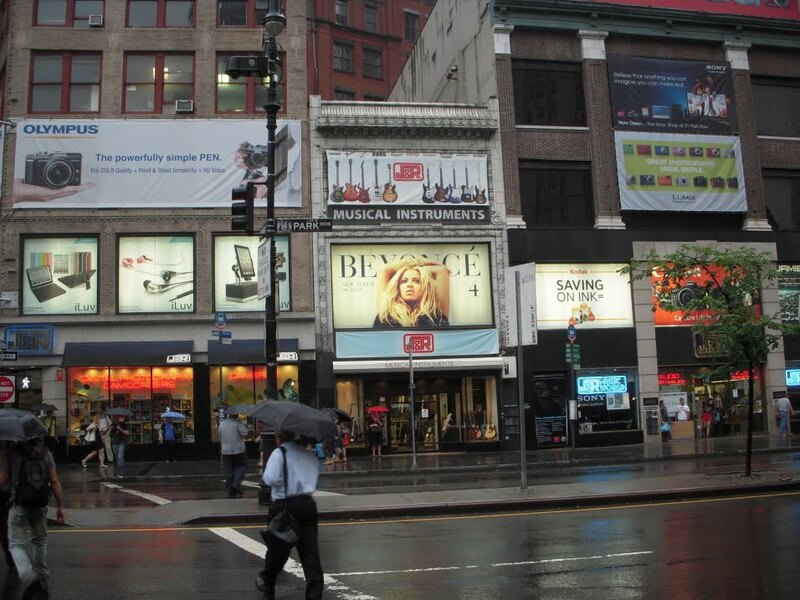 How large does this problem of private ownership of the public realm loom in New York City? 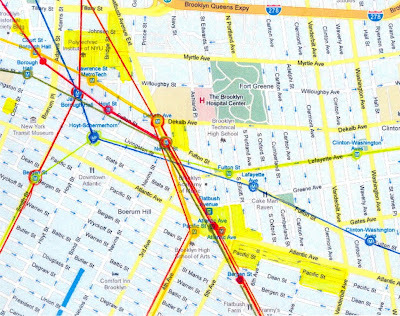 Consider what is happening to traditional Brooklyn with the 50+ concentrated acres (above) supposed to be owned by Forest City Ratner in the key central, dense areas atop the main public subway lines (see below). Those fifty acres include the 30 contiguous acres of the proposed Atlantic Yards where, at significant financial loss to the public, the Ratner/Prokhorov (“Barclays”) basketball arena is now being built. 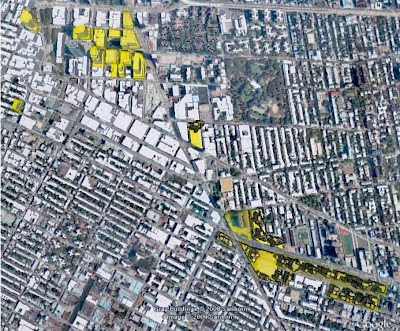 This 50+ acre mega-monopoly was brought about with government subsidies and the intervention of eminent domain abuse to concentrate this land ownership in the politically connected Ratner organization. In a significant government-assisted privatization of public space it incorporates streets, avenues and sidewalks previously belonging to the public, together with park, plaza and "public square" space that would otherwise likely have been publicly owned as well. The simple equation is this: Privatization eliminates the opportunity for speech; without space to publicly assemble the possibility of public speech retreats. If that's so, and I agree that it is, what does it mean when more and more swaths of the city are being privatized: Rater's 50+ acres, Columbia's new 17 contiguous acres being taken from the community in West Harlem (giving Columbia 35 acres of privately-owned monoculture altogether), the 26 private acres that will belong to the Related Companies at Hudson Yards (in addition to other Related holdings elsewhere), the 75 acres taken over the Willets Point development to be owned by one developer. Park Ownership Taylored to Bloomberg's Taste? Some protesters have pointed out that the mayor’s longtime girlfriend, Diana L. Taylor, is on the board of directors of Brookfield. The mayor’s staff, under strict orders from Mr. Bloomberg, did not lobby the owner of the park, Brookfield Office Properties, about whether to push ahead, leaving the decision up to the company’s management, according to several people involved in the discussions. This was in an a story about how the clean-up/eviction of the protesters had been called off due in large part to support expressed for the protesters and their rights by local politicians, see: Calls Flood In, City Backs Off and Protesters Stay, by Michael Barbaro and Kate Taylor, October 14, 2011. At the news conference in Queens, the mayor was asked if he had spoken about the protests with his girlfriend, Diana L. Taylor, who is on the board of directors of Brookfield Office Properties, which owns Zuccotti Park. “I can tell you that pillow talk in our house is not about Brookfield or Occupy Wall Street," he said. Imagine you are a protestor looking to get attention and the mayor with his control over city parks won’t let you stay in Union Square, Washington Square or the other city parks, the mayor’s girlfriend has helped kick you out of Zucotti Park, you don’t want to wander over to Forest City Ratner’s 50+ acres because the mayor is handing them all their subsidies (and the other subsidized developers are unfriendly as well?) so you strategize to go instead to the 550-Acre Hudson River Park run by a state-sponsored public authority? Sorry, the mayor’s girlfriend Diana Taylor is Chair of that authority’s board and Michael Bloomberg is on that board too. But don’t worry, their pillow talk never extends to how they want to see the parks used. Anyone wonder whether Bloomberg has made contact with the person in charge of the group wanting to express their “right to be silent”? What is significant about the Occupy Wall Street movement, which obviously stresses the physical taking of space as its most central symbol, is that this physical occupancy is breaking through to deliver a message that wasn’t getting through by other means. More about that coming up. In politics there is unfortunately an age-old tradition for those in political power try to seize the channels of communication to squelch the messages they don’t like. In his 2007 book, “What Hath God Wrought: The Transformation of America, 1815-1848,” Pulitzer Prize-winning historian Daniel Walker Howe recounts how one significant threat the South saw in Lincoln’s 1860 election was Lincoln’s reversal of a policy established by President Andrew Jackson in 1835 that had for years blocked the U.S. Postal Service’s delivery of abolitionist tracts opposing slavery. The Postal Service could not legally refuse to deliver mail to addresses but Jackson directed local Southern postmasters that they could under their own authority (technically not his) implement a system where abolitionist mail would be held in post offices undelivered. Instead, a notice would be sent to the addressees (abolitionists were targeting moderates in order to swing their opinions) saying that the office presumed that they would not want these mailings but that if the addressees did they could notify the Post Office to that effect. As a further intimidation, if such moderates did ask for delivery of their mail their names might be publicly posted. 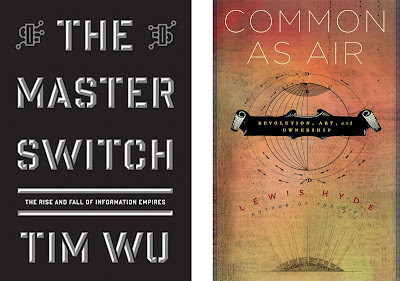 I have recently been writing about a two truly excellent books, “The Master Switch: The Rise and Fall of Information Empires” by Columbia Law Professor Tim Wu and “Common as Air: Revolution, Art, and Ownership” by Kenyon College and Harvard University Professor Lewis Hyde. (See: Friday, September 30, 2011, Could the Atlantic Yards Monopoly Be Even Less Regulated Than It Is? Why A Mega-Monopoly Continuation Isn’t Workable, Tuesday, September 20, 2011, A Parable: Some Words Concerning the Future of Communication, Wednesday, September 7, 2011, The New York Times Takes an Editorial Position on the Subject of Encouraging Competition and It’s Inconsistent With Its Position on Atlantic Yards.) Each is about aspects of aggregating power over communication. Those two authors each express significant worries about the control of speech by reason if privatization and monopolizing ownership of the channels of communication available to us. Each also observes that when government is involved in abetting the formation monopolies the channels of communication get commandeered to control political speech and select those who will be in power. Professor Wu’s focus is more on the private ownership of the technological means and distribution of communication. Professor Hyde’s focus is primarily on how communication and thinking is being impeded by virtue of the privatization of our cultural commons and reference points occurring through an incredible extension of copyright rules. 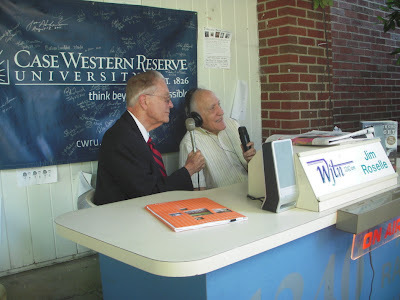 Wu points out relationships and reasons the Western Union people wanted Hayes, the Republican, to attain office, including that “much of what were eventually Western Union’s lines were built by the Union Army.” Western Union carried (Hayes-favorable) Associated Press stories to the exclusion of others, “working with the Republican Party and avowedly Republican papers . .” doing “what they could to throw the election to Hayes.” More important, according to Wu, Managing New York Times editor John Reid, an ardent* Republican, worked with Western Union telegrams to manipulate available information about who had actually likely won the election so as to swing the electoral votes of Southern states to Hayes. Among other things, this complicated bit of history is widely viewed as having been what ended Reconstruction in the South. 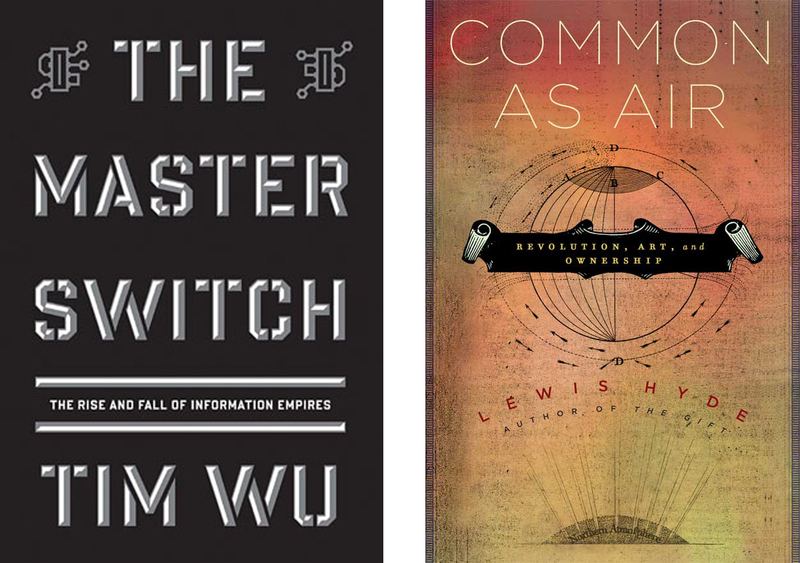 Professor Wu’s book provides some marvelously subtle and intricate analysis of how control and ownership influences the nature of the content of communication that ultimately gets through to the public and informs our culture. In one section of the book he talks about how Hollywood’s Production Code, the moralistic Hays Code from 1930, was able to come into effect (without government assistance) because of the monopolistic structure of the film industry and he theorizes convincingly that the “New Hollywood era,” with films that were “edgy and defiant affairs” and challenging to values of society like “Easy Rider,” “Midnight Cowboy” and “Bonnie and Clyde” might not have come along had industry’s ownership structure remained unchanged. If making yourself heard cannot be practically accomplished in an actual public square but rather depends upon some medium, and upon that medium is built an industry restricting access to it, there is no market for free speech. Wu also talks about copyright, for instance the way that control over copyright (because of the ownership options involved) has helped generate the culture we see today where so many films are based on comic book characters. Like Professor Wu he notes the importance of freedom of expression on the Internet and makes the point the Internet is able to function successfully as it does because the “network protocols, the set of communication rules that made the web possible” were released to and made part of the public domain rather than restricted by copyright. For democracy to flourish after the America Revolution meant discarding both the tools by which oppositional voices were silenced and the consequent aristocratic norm of pretended consensus. He contrasts this with the time before the revolution when newspapers were printed only “by authority” of the government and dissenters could be jailed, exiled or executed. We certainly don’t execute our dissenters these days but if the elements of speech are privatized through ownership, particularly concentrated ownership, as both Wu and Hyde argue is often happening in so many ways then money and speech become interchangeable, but in one direction only. When money is speech, then to have a 1% sliver controlling most of the nation’s wealth (as objected to by Occupy Wall Street) means that dissent does suffer exile. In America with money equating with speech more and more (and many of the wealthy would have it be even more so) we have given “Predominancy” to that sect the creed of which is plutocracy. It is important to observe that neither Wu nor Hyde are arguing against capitalism. What they are alerting us to is the problem of an out-of-balance monopolistic concentration of rights with respect to speech that is facilitated by government alliances, when instead the government should be limiting such monopolies so as to achieve a more recognizably Adam Smith kind of capitalism. Each makes convincing arguments as to why limits on such concentrations of rights is the healthier, more workable way to organize capitalism, society, public discourse and the exchange of ideas. Objection to the teaming up of government and monopoly should be common ground for both the Tea Party and Occupy Wall Street activists although I suspect that the proportion of Occupy Wall Street protesters astute enough to realize this may be greater. Also, neither Wu nor Hyde take on the subject of the general skewing of wealth in the country but they do each criticize the concentrated piling on of additional rights for those who are already ahead in the game. How does the skewed wealth of the nation affect the drift, content, and overall perspective of public discourse and debate in this country? Technically don’t we have, after all, protected free speech? Technically, we do but when lucre is speech the exercise of that constitutional right must compete for meaningfulness with the cacophony of the speech-on-steroids that is influenced or paid for by money in ways almost too numerous to catalog. I have already written about how, when Atlantic Yards, New York City’s biggest boondoggle and political scam was launched, the New York Times, which would like to think of itself as earning a reputation for protecting the public and insisting on good government, fell down on that job. For all intents and purposes it colluded in the mega-development’s promotion while having entered into a business partnership with the developer to build its new headquarters. 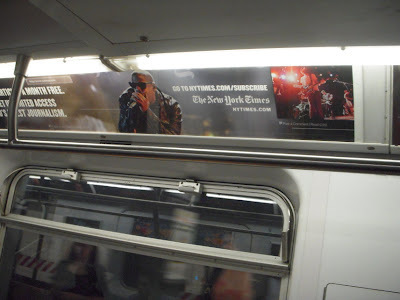 (See: Sunday, June 26, 2011, “Page One: Inside the New York Times” Reviewed; Plus The “New York Times Effect” on New York’s Biggest Real Estate Development Swindle.) That’s the influence of money. The arena that is now being built at Atlantic Yards is being publicly subsidized at great cost, resulting in a substantial loss to the public of hundreds of millions of dollars. The arena has been accurately described by Tom Ziller (at SBNation.com) as “simply Vaseline for a real estate project [and- I add- accompanying land grab] in Brooklyn that will make his company billions more than an NBA team could ever be worth.” Nevertheless the public is being told to like it. 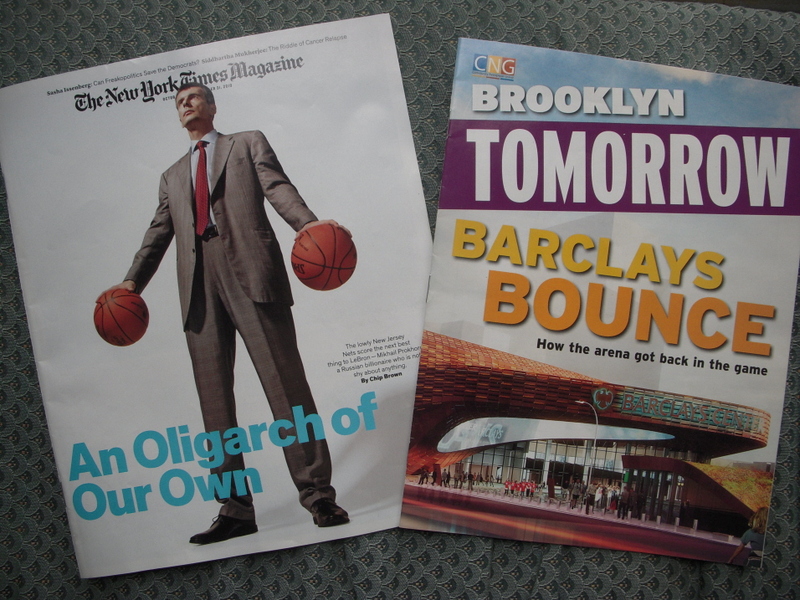 On the first Halloween weekend (October 2010) after its publicly-protested groundbreaking Brooklyn residents found two promotional packages for the Ratner/Prokhorov arena landing on their doorsteps: One was a “CNG” (“Community Newspaper Group”) “Brooklyn Tomorrow” magazine with a “Barclays Bounce” cover; the other was the New York Times Sunday Magazine with the Russian Oligarch and basketball team owner, Mikhail Prokhorov, on the cover conspicuously palming two basketballs in his enormous hands. two dozen high-cheekboned knockouts in lethal heels and dresses that were more like plot summaries. The blue and gray plastic V.I.P. bracelets on their wrists made them look like a flock of banded herons. Although Prokhorov’s official residence is a village in the Krasnoyarsk region of Siberia, where he pays upward of $500 million a year in taxes, he lives in Skolkovo, 45 minutes north of Moscow, in a sprawling 21,500-square-foot house he finished building six years ago. More important to the theme of this Noticing New York essay is a subtext in the Times article about Prokhorov’s ability to control the press. Twice the article has Prohorov demonstrating to reporter Chip Brown how the reporter would himself get bested if he attempted to put a gun to Prokhorov’s back. That's the way the article begins. The second time it is coupled with the reporter’s quip about how only part of the afternoon he spent with Prokhorov in his mansion was devoted “to disabling journalists.” Tying all this together are associated references to Prokhorov's attaining supremacy “in a very soft manner” (he could have broken the reporter’s leg “in a very soft manner”) and the last book-ending line of the article which concludes with the word “softly” as a reference, not only to a spoken of victory, but the opening use of the word respecting Prokhorov's power over the visiting reporter. The overall point here is that even if Russia is was ranked as the 8th most dangerous country in the world for journalists (it is now ranked 9th just after Mexico) and the most dangerous in Europe by the Committee to Protect Journalists, even though the Times decries how journalists are with impunity murdered and maimed to control coverage, Prokhorov understands the value of “soft” control of the press and knows how to use it. Soft control, that’s the influence of money. 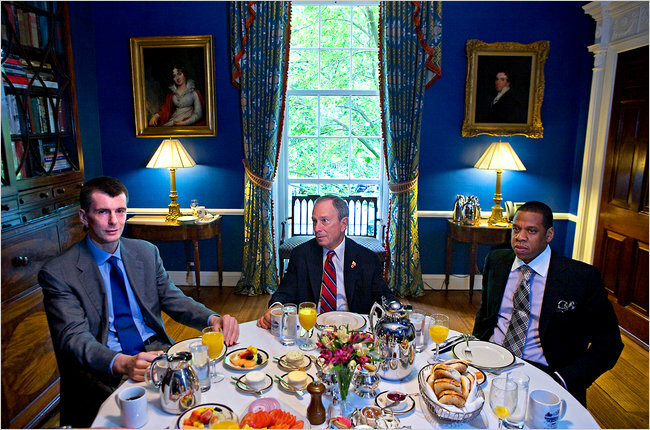 The article contains a now infamous picture of Prokhorov, Bloomberg and Jay-Z dining at Gracie Mansion. That's the influence of money. As noted above, the editor of the Community Newspaper Group, (CNG) denied that the “Barclays Bounce” “Brooklyn Tomorrow” magazine was an advertorial. But that denial is probably rather academic. “Community Newspaper Group” is something of euphemistic misnomer. It’s a large group of local newspapers, formerly feisty, now acquired by Rupert Murdoch. Rupert Murdoch doesn’t need to be paid to publish blandishment-style exaltations of the exploits of the supremely affluent. Murdoch courts power and the brokering of it which is why his agglomeration of press outlets (written about here), including the New York Post, Wall Street Journal and Fox outlets, is so distressing. What’s more, Forest City Ratner is the Community Newspaper Group’s landlord. That’s the influence of money. The question is raised whether the Occupy Wall Street protestors should permitted to utilize the space of Zucotti Park to express themselves but we are surrounded everywhere, throughout the public realm, by purchased corporate speech for which no permission ever seems necessary. We drown in it. Once upon a time New York’s subways were covered with painted-on graffiti. I was never a fan of having to live with it though I can appreciate the exuberance and artistic nature of some of the designs. I even recognize that it was a form of speech. I was glad when it was eradicated. 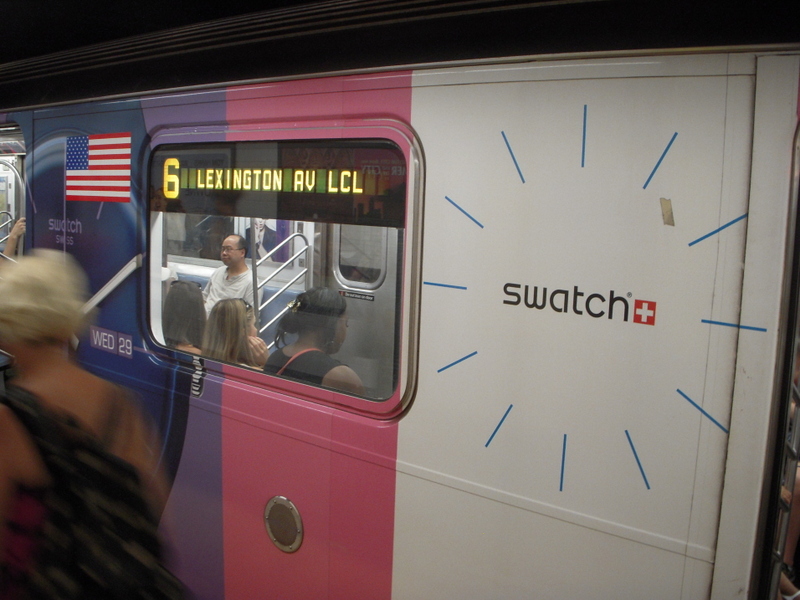 But now subways are again being covered by designs, this time advertising, corporate graffiti, part of the barrage of corporate speech to which we are constantly subject. This speech is permitted without question. Just as I was not in favor of the subway graffiti of old I am not in favor of the corporate graffiti appearing on those same trains and I am not in favor of the cooperate graffiti of replacing the names of Brooklyn subway stops with the name “Barclays” (a bank) for the Ratner/Prokhorov basketball arena. 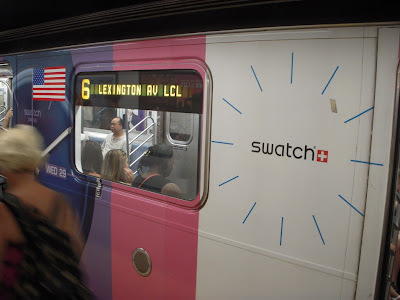 In typical tilt-things-in-favor-of-the-rich fashion the public's MTA gave the naming rights to those stations to Ratner virtually for free, allowing Ratner to then privately profit by selling the right to graffitize the stations for a truer value. 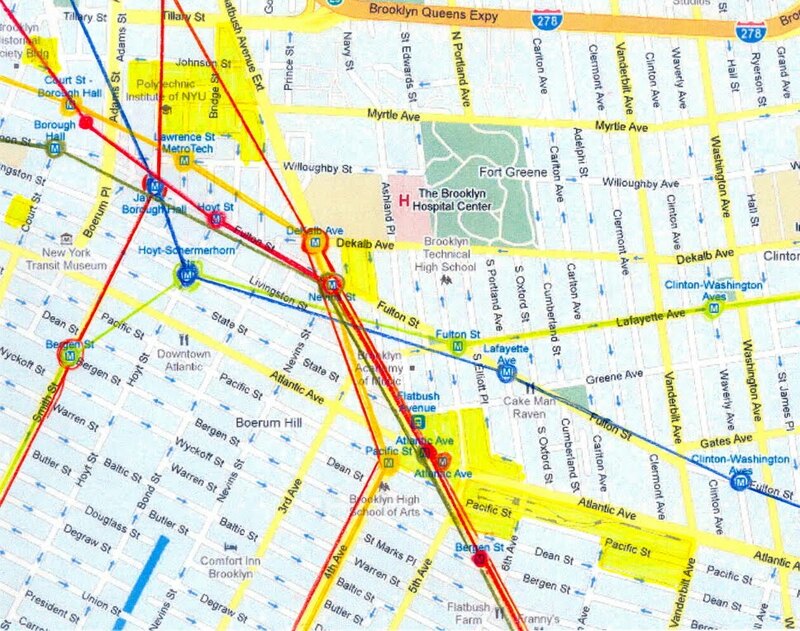 (See: Sunday, June 28, 2009, Naming a Problem: The MTA Gives Ratner the Right to Name Brooklyn Subway Stations “Barclays”) That's the influence of money. Does it serve us when the public’s attention is so distracted by press releases about circuses and sporting events? This may seem sour, but the enormous amount that is spent on such speech and the fact that so much private speech materializes precisely because is paid for might be less of a concern were it not for the skewing of the wealth in this country that is able to pay for such speech. Politicians command headlines. Can they break through the din of this corporate speech? Yes, they can, but for that to be meaningful they have to be on your side and if you are not careful they can mangle the message. Do you remember the story of the Wall Street money manager at the beginning of this article who scolded senators Schumer and Gillibrand for not coming to Wall Street’s defense saying, “They need to understand who their constituency is”? As soon as it was likely that Andrew Cuomo would be governor of the state Forest City Ratner made contributions to his campaign. That contribution was never returned despite identified conflict of interest. In New York City we have an office called the Public Advocate, the theory being that its holder advocates for. . yes, the public. Forest City Ratner also contributed to Bill de Blasio, the holder of that office and de Blasio has never advocated for anything that is likely to give New York’s plutocrats agita. The New York Attorney General is responsible for doing investigations in this state. Atlantic Yards needs to be investigated. Will Eric Schneiderman, the current holder of that office, investigate? He too has received campaign contributions from Ratner. (See:Wednesday, October 19, 2011, Catching up on Bruce Ratner's campaign contributions: to de Blasio and New York Uprising (and would past gift to Schneiderman stave off Downtown Brooklyn Partnership investigation?). Once again, that’s the influence of money. The Audacity of Wanting Change Rather Than "Hope"
A quieting restoration of “hope” is something that actual Wall Streeters might be happy with. I think that what the Occupy Wall Street crowd is instead interested in is actual an actual change in the way things work. I think the message the Occupy Wall Street crowd is delivering about Wall Street and the Wall Street crowd is the same message that was delivered about the banks in the movie “Bonnie and Clyde”: compared to the rest of us, they have too much. . . It’s not fair. I would go one step further: the fact that they have to much presents serious questions about the adequacy of our free speech, the ability of the rest of us to make ourselves heard. That brings us back to where we began. 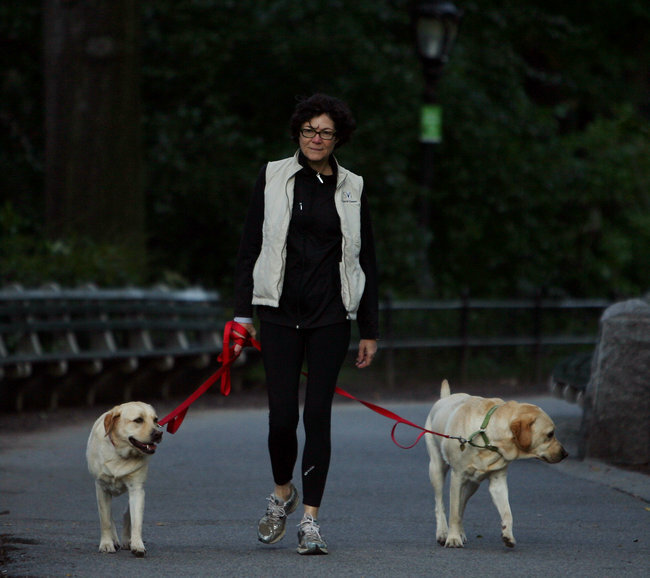 Who can say whether Bloomberg just snapped his fingers and summoned up a mayor-loves-dogs story? Maybe he didn’t. But what was he thinking if he knew that this story was going to run in the Times, alongside what could have been the perhaps very bloody spectacle of an eviction of the protesters from Zucotti Park? With all the media and paid-for speech that the mayor and friends can so readily summon to the political fray there may be one lucky protection for the 99%: that Mr. Bloomberg, the mayor and second richest New Yorker, would be so tone deaf, so incredibly tone deaf that he even named his dogs after those famous bank antagonists, Bonnie and Clyde.